The EU has proposed tariffs on $20bn (£15bn) of US goods in a long-running dispute over Boeing aircraft subsidies. 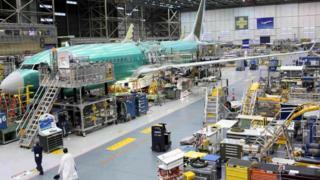 The proposal comes after the WTO said earlier this month that the US had failed to remove some Boeing subsidies. The EU move comes after the US said it was considering tariffs on about $11bn (£8.4bn) worth of EU goods in response to Airbus subsidies. And it comes after the EU approved plans in April for trade talks with the US designed to reduce trade barriers. The proposed tariffs cover a range of products from aircraft to chemicals and food products including frozen fish, citrus fruit, and ketchup. The EU's threat to impose new tariffs on US goods doesn't exactly lighten the mood in a situation where global trade tensions have already intensified. But this proposal - like the corresponding US plan for action against the EU over subsidies to Airbus - is consistent with the established rules of the World Trade Organization. Both sides have published lists of goods for consultation and both say they will wait for a WTO arbitrator to tell them how much action they should take. It's an important difference from the dispute between China and US, and American action over steel and aluminium, where it can be argued that countries have gone beyond what the WTO rules permit. Those actions led to genuine concerns that the rules-based system for managing global trade may be facing serious threats. But the proposed retaliation on aviation does not. The Trump administration last week proposed targeting a seven-page list of EU products for tariffs, ranging from large aircraft to dairy products and wine, to counteract the harm from EU subsidies for Airbus that are worth an estimated $11bn. The EU has responded with its own 11-page list of US imports, including agricultural produce and dried fruit, to planes, tobacco, handbags, suitcases, tractors, helicopters and video game consoles. "The EU remains open for discussions with the US, provided these are without preconditions and aim at a fair outcome," Ms Malmström said. Both sides have said they would prefer a settlement that did not lead to tariffs being imposed. Meanwhile, the EU has said it is ready to start formal trade talks with the US. The Commission is set to start two sets of negotiations - one to cut tariffs on industrial goods, the other to make it easier for companies to show products meet EU or US standards. But the EU has insisted that agriculture will not be included, putting it at odds with the US, which wants farm products to be part of the talks.